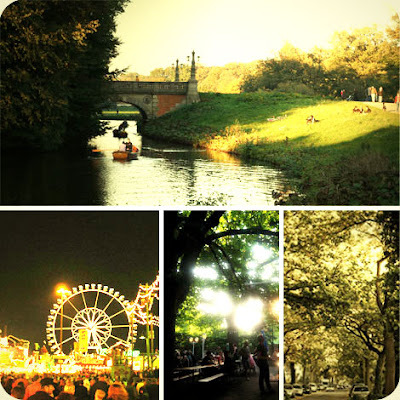 Sometimes Sweet: A Slice of...Bremen, Germany! Hello everyone, I'm Kim from notcrazyunwell.com / notcrazycreative.com and I am very excited about this chance to show you a little slice of my hometown of Bremen in northern Germany. Thanks so much for this opportunity, Danielle! I was born and raised in Bremen, and apart from 13 months between '97 and '98 that I spent abroad in the Twin Cities, I've lived here all my life. I love my hometown. With its population of roughly 550,000 people it isn't a small town but also not a huge city where you can barely make it from one end to the other in a day. One of the things I love most about Bremen is the fact that you can get almost everywhere by bike or public transportation. Up until 2007 – when my boyfriend C moved here with me from the U.S. – I didn't even have a car. The beautiful river Weser runs right through the middle of Bremen. It's an important part of the city and there is always a lot going on along the river. In the summer you will see people chilling on the grass of the dike/levee, having BBQs or just drinking some wine or beer pretty much 24/7. There are also several cafes along the river. One of my favorite ones is the Café Sand with a small beach, nets to play volleyball and lots of tables outside. There is even a small ferry that goes across the river right to the beach of the Café Sand during the summer months because it's located between two bridges and would be somewhat difficult to get to on foot or bike without the ferry. 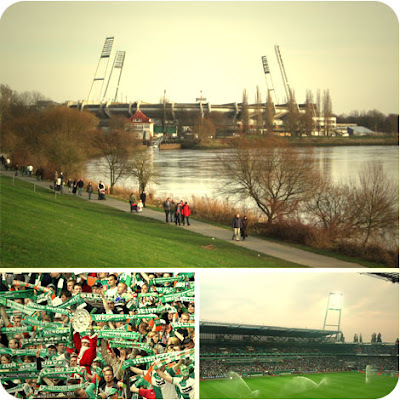 The stadium for our local soccer team Werder Bremen is also located right at the river. So during the soccer season there's always something going on on game days. If you're interested in soccer at all, I recommend you try and get tickets to a home game. The atmosphere is amazing and you can usually get tickets for right around 15-30 Euros which makes it much more affordable than American Football… Then in the summer there are usually a few concerts in the stadium during which hundreds of people just bring blankets, drinks and snacks and just get comfortable all around the stadium to listen to music. Another great area along the river is the Schlacht. It used to be the medieval harbor of Bremen (the modern port is some kilometers downstream) and is now a riverside boulevard with pubs and bars aligned on one side and the banks of Weser on the other. It is always packed there in the summer and even during the colder months it's a popular place to go bar-hopping. 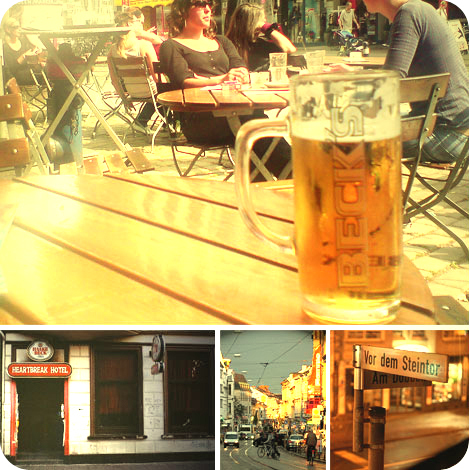 Another place I would recommend you should definitely go to if you're ever here is the Heartbreak Hotel in the Viertel. It is tiny, the interior is really red, old-school, and kind of dirty but it's busy every single night and the atmosphere is absolutely unique. I probably wouldn't go before 10 pm and once you're there (I recommend Thursday nights) ask the bartender / owner Felix about the vodka-rhubarb-long drink he makes. It is the BEST. A few minutes walk away – kind of “hidden” is the “Schnoor," which is definitely another one of my favorite places in the city. 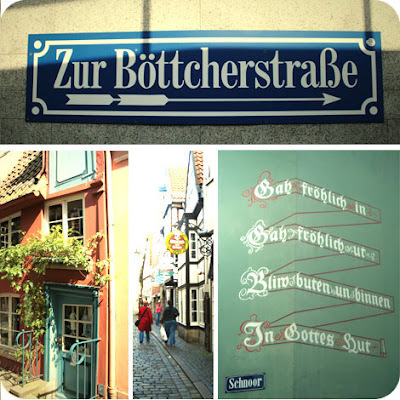 The “Schnoor” is a small but really well-preserved quarter of crooked lanes and fishermen's and shipper's houses from the 17th and 18th centuries, now occupied by cafés, artisan shops and art galleries. 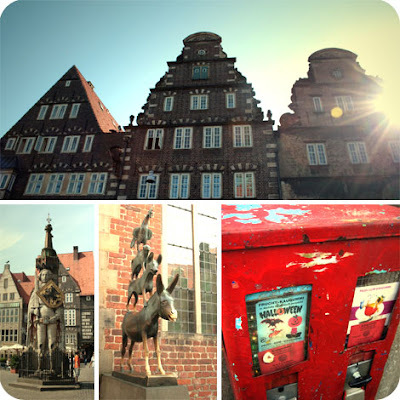 It’s one of the areas where you really feel and see just how old Bremen is. It’s beautiful and you can see something new every time you walk through the tiny lanes and paths. Bremen is very multi-faceted, which is one of the reasons I think it’s so beautiful. There are a couple of fairs each year with rides, booths, music and parties as well as a beautiful Christmas-Market in the city center in December. There are a lot of beautiful neighborhoods with houses over a hundred years old and still in great shape. There is a gorgeous park about a five minute bike-ride from where I live that’s always busy with families going for a stroll, joggers, old couples going for their afternoon walk, people walking their dogs...there is a small “zoo” and a couple nice restaurants in the park; it’s one of the things Bremen is particularly proud of. My dad is from Bremen! He hasn't lived there in over 50 years but still remembers bits about it and has always wanted to go back! At one point we even looked on Google Maps satellite view and he showed me the piece of land where his house once was. Sounds like a great place! I've wanted to go to Germany for a long time. Thanks for sharing! 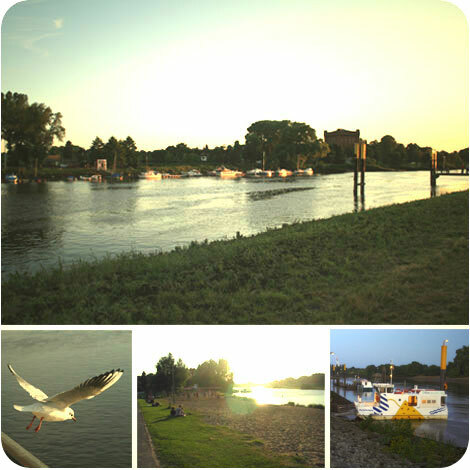 I love Südstadt, one of my best friends lives there. if i ever have children i´ll move away from berlin to this cute and green (and near by my parents) town! I love Bremen, too! It's always on my list when I go visiting friends in Germany, and be it just to take a little walk around the little alleyways and down to the river. 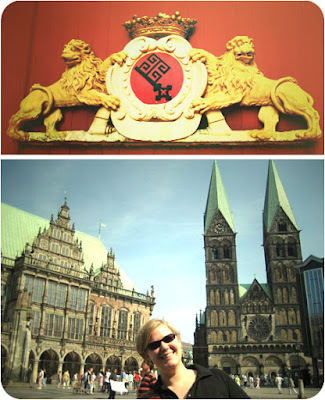 bremen is my hometown, too! and i love this post und the city! and great tattooartist live here too! !